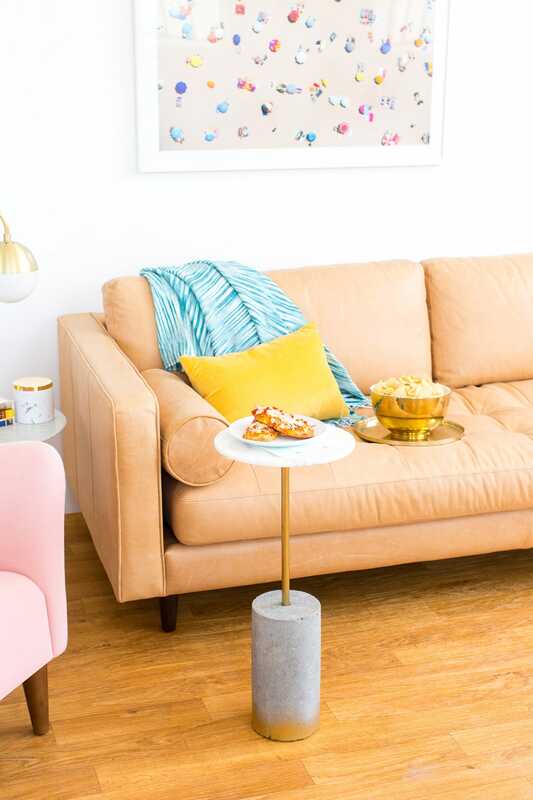 Okay, okay, so technically this table isn’t in the shape of “C”, but it turns out that there aren’t many other cute things to name a snacking table for your sofa. 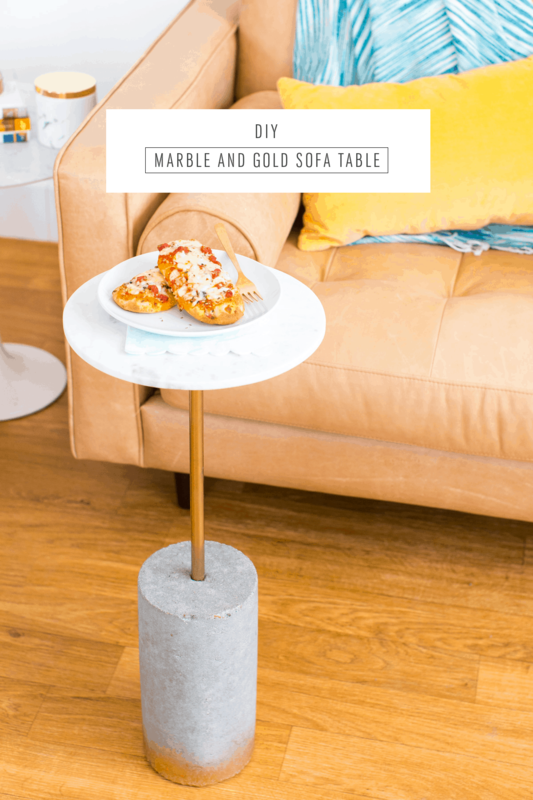 Calling it a TV dinner table also didn’t quite do it justice, and I’ve been itching to make this DIY marble and gold c table for quite a while after some serious material deliberation and research (thanks for your help Zach!). 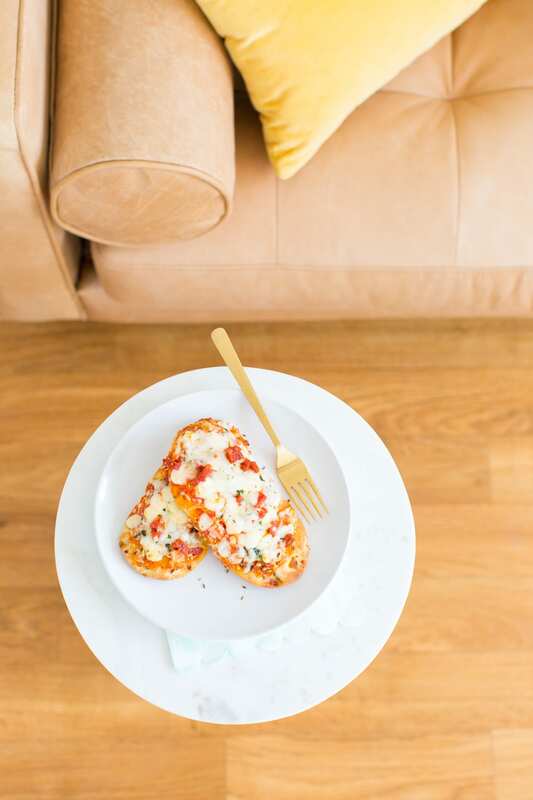 So when we were asked to DIY the perfect little something for a movie night to celebrate how the new DIGIORNO Artisan Style Melts help you rise to any occasion, I decided to finally bust this one out, cute name or not! 3/8 inch galvanized pipe 26 inches in length with screw threads on one end (we purchased ours from a local Ace Hardware store that will cut it to size for you based on the height of your sofa). 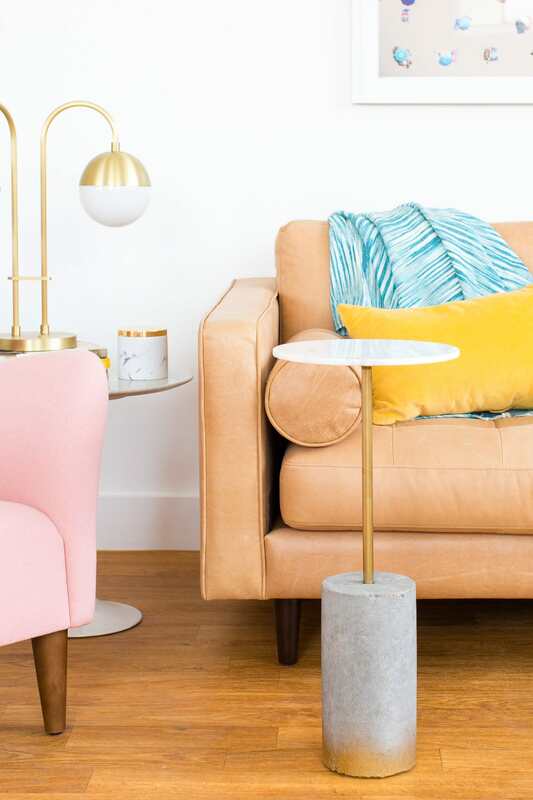 Before painting or gluing anything, assemble the pieces of the pipe and floor flange (making sure the surface is clean), and place into the cylinder to make sure everything fits and is the right height for your sofa. 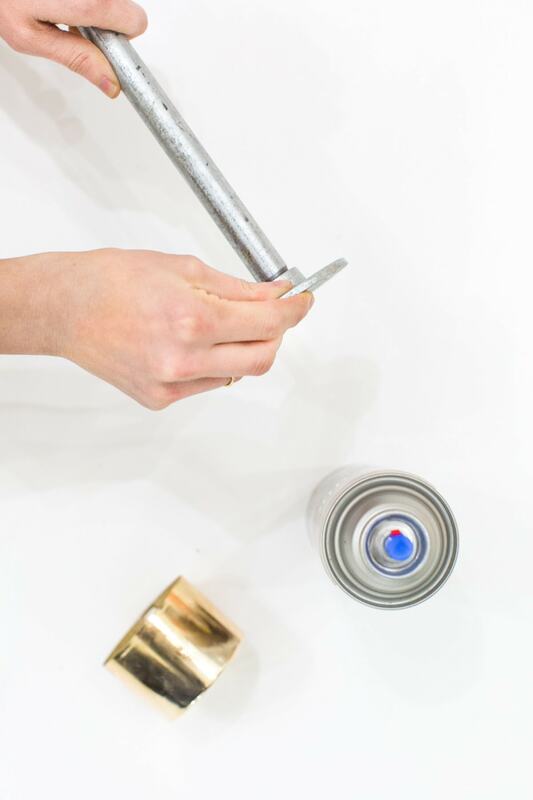 Remove the pipe and place it upside down so that it stands up on the floor flange to be able to spray paint it metallic gold. 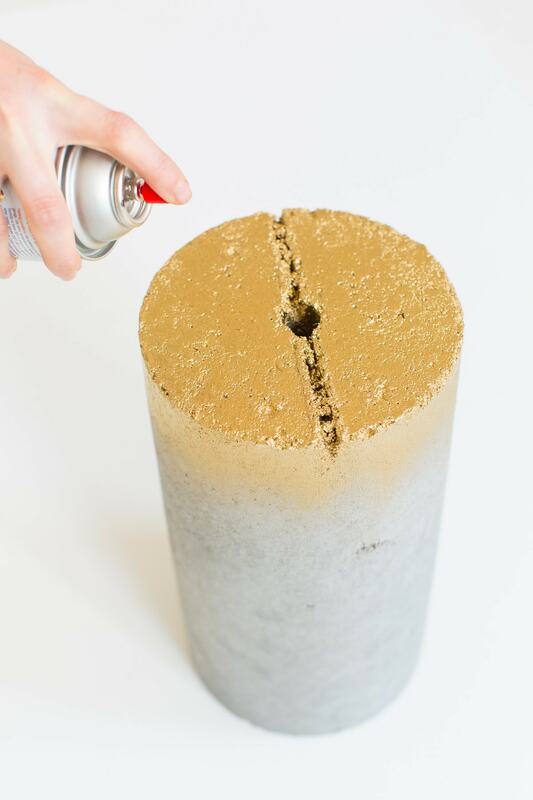 While that’s drying sand down the side of the raw cement cylinder for a smoother, cleaner look. 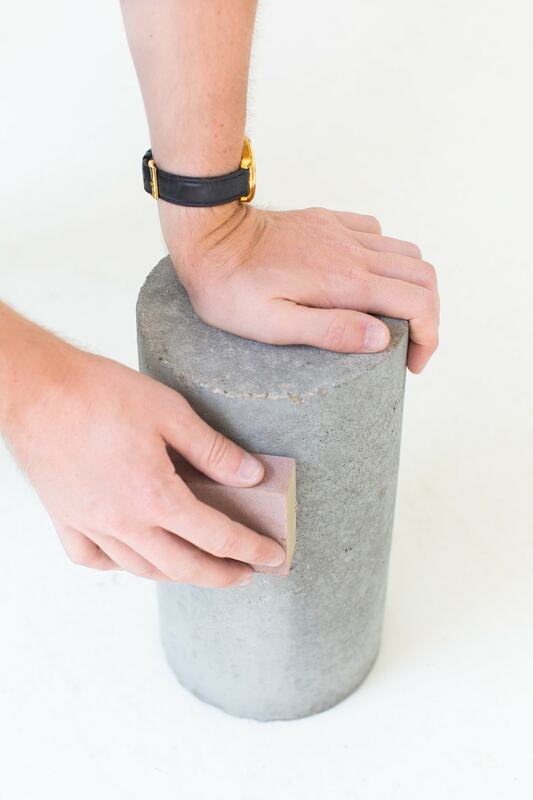 If you want it to look polished, you can use an electric sander with fine sand paper. 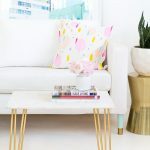 You can also create the metallic gold ombre look like we did for the bottom of our table, by flipping the cylinder upside down and lightly spray painting the edges with metallic gold paint from about 12-15 inches away and let dry. Cut one of the large square felt pads down an inch on all sides to make it fit with the edges unseen on the bottom of the cylinder to making moving the table around easier. Now all that’s left is gluing the pieces together! 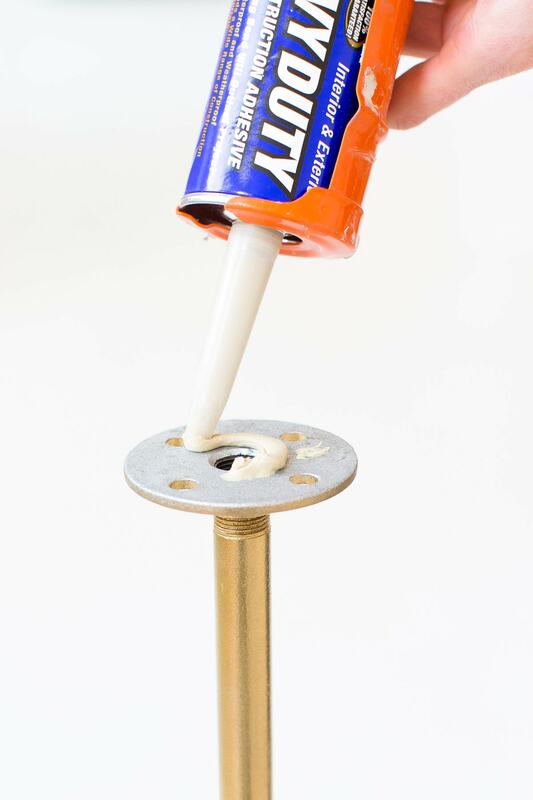 First squeeze liquid nails in the hole in the cylinder and let stand to become tacky for about 5 minutes, then insert the metallic gold painted pole. Next use the liquid nails on the flat piece of the floor flange and place the marble board centered on top. Let all of the pieces dry/set completely for 48hours before use or moving. 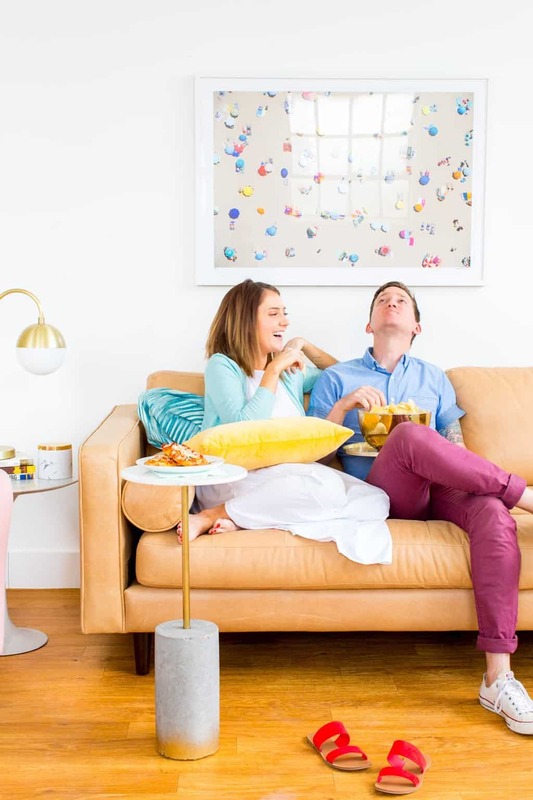 Now all you need is your favorite television series and some snacks! 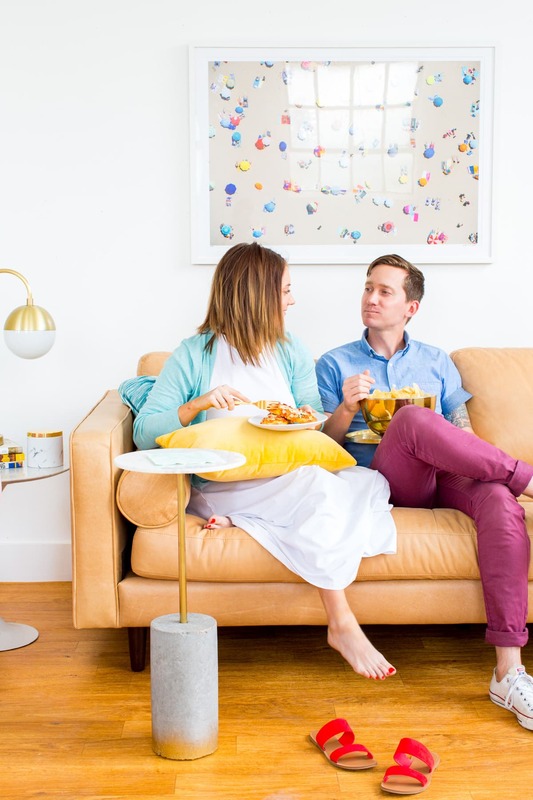 Since we’re equal parts cheddar popcorn, tortilla chips, and pizza lovers, we just went with all three, because why the heck not? The DIGIORNO Artisan Style Melts are meant to be enjoyed as snack, comes out fresh-baked from your own oven (or microwave) in minutes, and are topped with fine cheeses, sauce from vine-ripened tomatoes, and premium meats and vegetables. 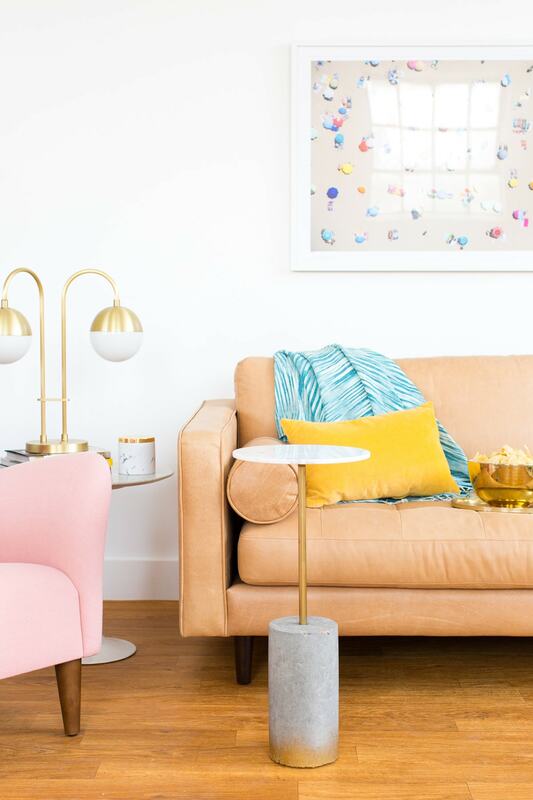 And of course a pile of macarons and our cute new sofa and pink chair never hurts either, ha! What are some of your movie-night go-to’s? I’m thinking I need to put together another list of our favorite things to watch so you all can catch us up to speed on cool new things! Lastly, a thank you to DIGIORNO pizza for partnering with us on this post! 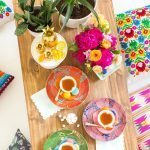 You can find more on their Facebook, Pinterest, Twitter, and Instagram pages. 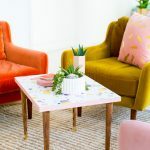 love this, I am continuously amazed at the diy projects you come up with! Amazing! This is one of the best DIY i’ve ever seen. I love it! Wow! I pinned it! I love this table. You make Working with concrete a breeze. The end result is a UNIQUE table. I really enjoyed seeing you and your “Fiance” together too. Could you two be any cuter? 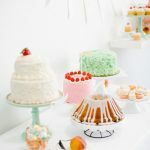 I love this idea-it’s just as adorable as you! 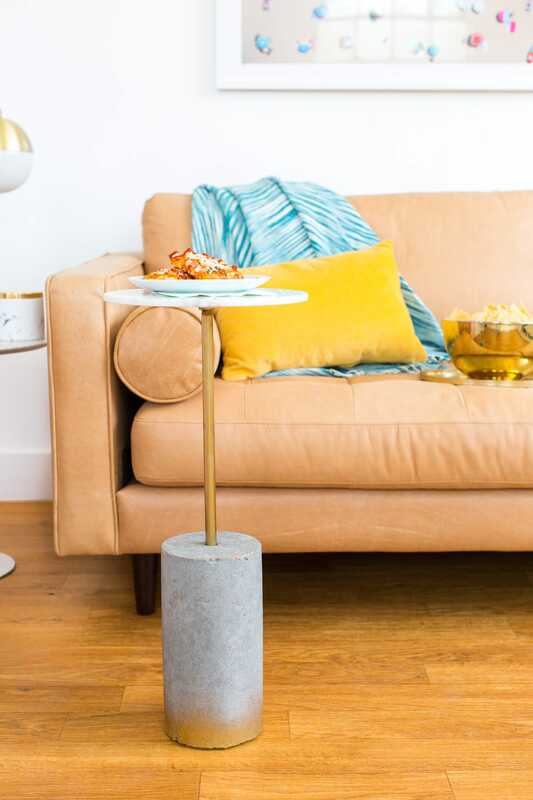 Are the concrete post made by you, if so how? 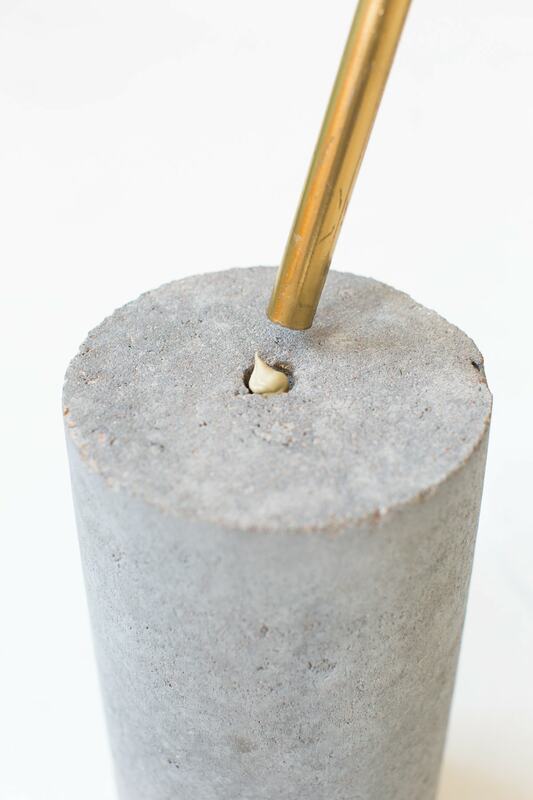 no we didn’t make the concrete post but you can find it as the first link in the “Materials” section! Hope this helps !